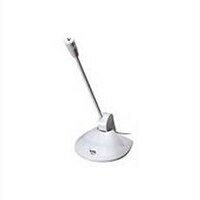 cs-spawar-cyber acoustics-RETAIL SLVR DESKTOP UNI DIRECT ACCS MICROPHONE ON/OFF SWITCHClassically designed, the CVL-1064 desktop microphone is ideal for anyone using Voice Over IP or web video conferencing. Leaving a small footprint on your desk, the CVL-1064’s on/off switch is easily accessible for a quick mute option. The uni-directional mic picks up the slightest whisper and is adjustable for your optimal speaking position.